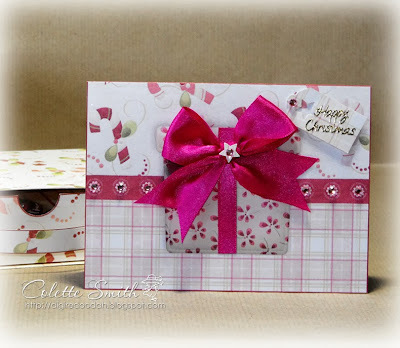 A while ago I made some Christmas samples for Mei to show at the craft shows she attends and although it has taken me a while to get around to it, I have finally managed to get them blogged. On this card I arranged the flowers in the shape of a Christmas tree adding a couple of stick on gems to the middle of my precious snowflakes. Here I used the flowers to decorate my wreath shape, adding a bow tied with both organza and metallic edged ribbon and topping off with a diamante snowflake topper and cats eye dazzlers in the corners to finish off. 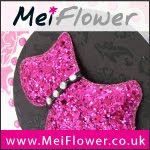 Some of the items aren't available on the website as yet, but you can pick them up at any of the craft shows Meiflower attends and also by phoning through an order. 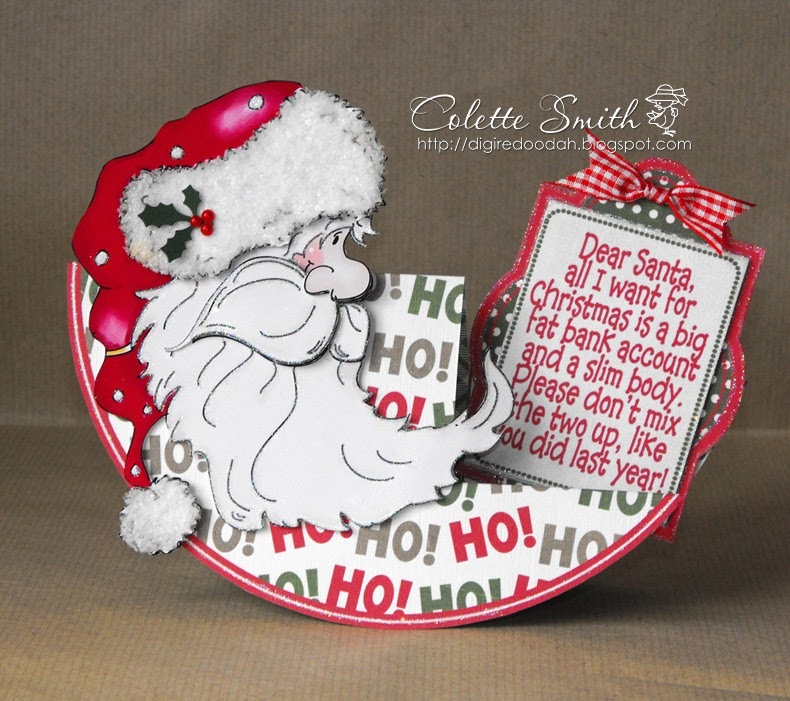 Hi all, just wanted to show you this Christmas card made using a Sassy Cheryl image, which has been decoupaged and then fixed into place on the card with an Action wobble spring, so that when you give Santa's head a nudge or move the card the head wobbles about - the kids love it! 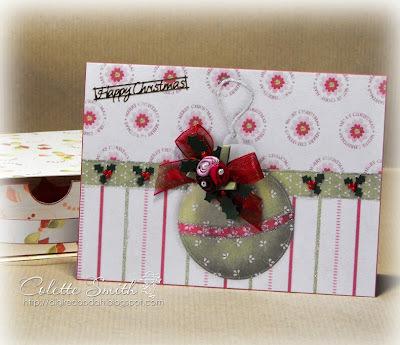 I used Meiflower burgundy grosgrain ribbon and stick on pearls to the card to add a bit more interest. Today I have a couple of cards to show you all made with the same Nitwit collections kit - unfortunately when I printed out the first one I hadn't realised that the yellow ink nozzle was blocked and the colours came out different to how they should be, saying that I quite liked the colours so made it up anyway. I used Meiflower satin ribbon Rosebud trios, ready made silver bows and 2mm crystals to decorate the tree. 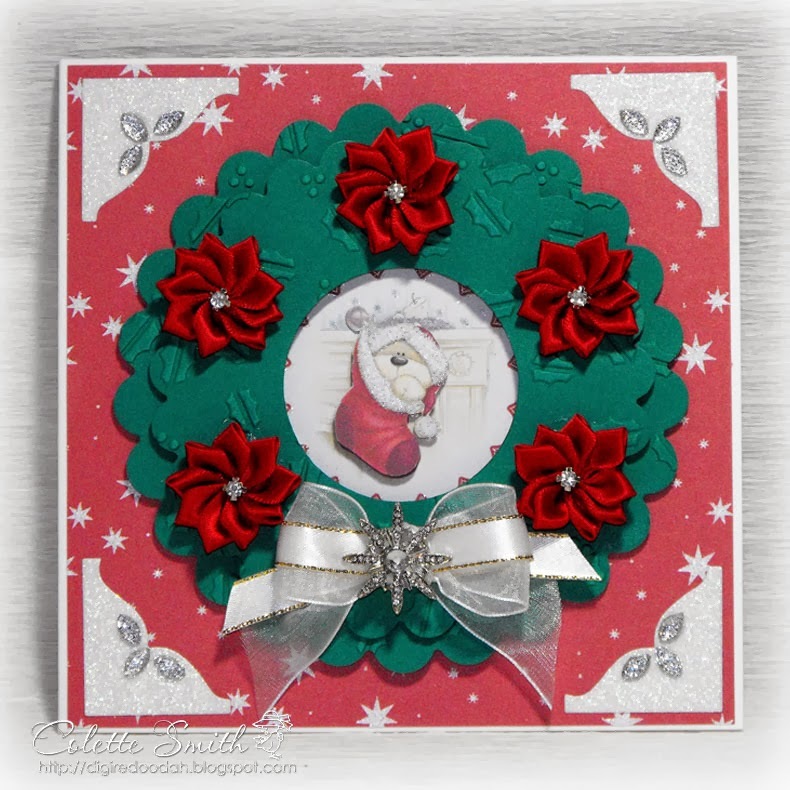 bunching a trio, a bow and some punched out holly leaves together and then filling the spaces with crystals in groups of three. 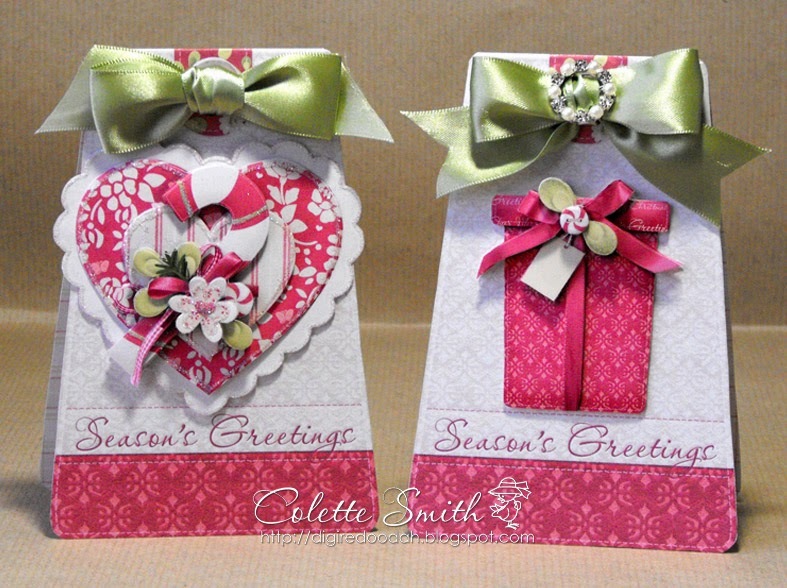 Inspired by the tag from the kit, I decided to use it to make a couple of tag shaped cards (I had fixed the ink problem by now, so these came out in the proper colours) using Meiflower wide satin ribbon to make bows for both, and adding a diamante and pearl ribbon slider to one. 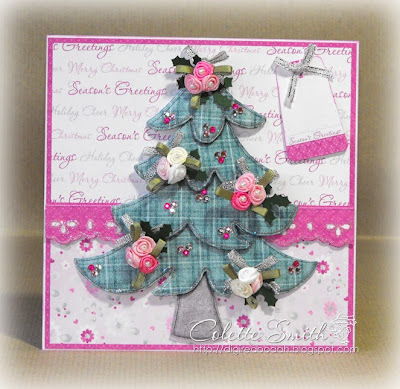 Here's another quickie card, once again using a freebie Christmas tree digi stamp from Birds Cards and inspired by the sample card next to the digi stamp. The papers I used should be red and green, but when I printed them out I didn't realise that the yellow ink nozzle was blocked, which resulted in the teal and purple colours you see below, I actually really liked the colours so used the papers anyway. The tree is decorated with ready made gold bows from Meiflower,and some 2mm green gems. I also found some organza ribbon, which matched the card colour perfectly. 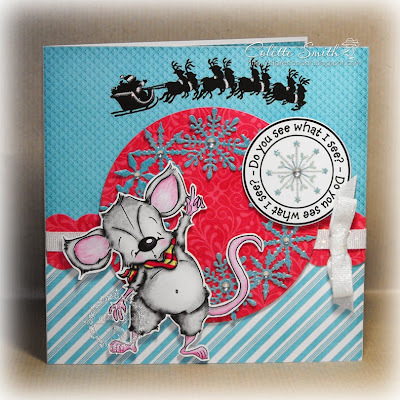 This was a sample card for Mei to put up at the craft shows so had to be 6x6, which meant I had to tighten up the bows a little and trim the ends. I am pretty sure that if the card was A5 size the bows could be stuck straight on from the bag. 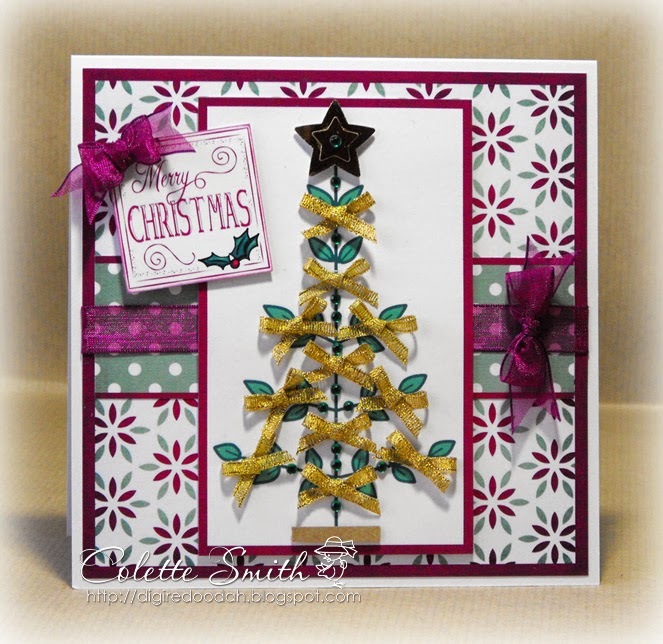 Today I have a quick and easy Christmas card, using a very simple Stick Christmas tree digi stamp, (a freebie from Birds cards). 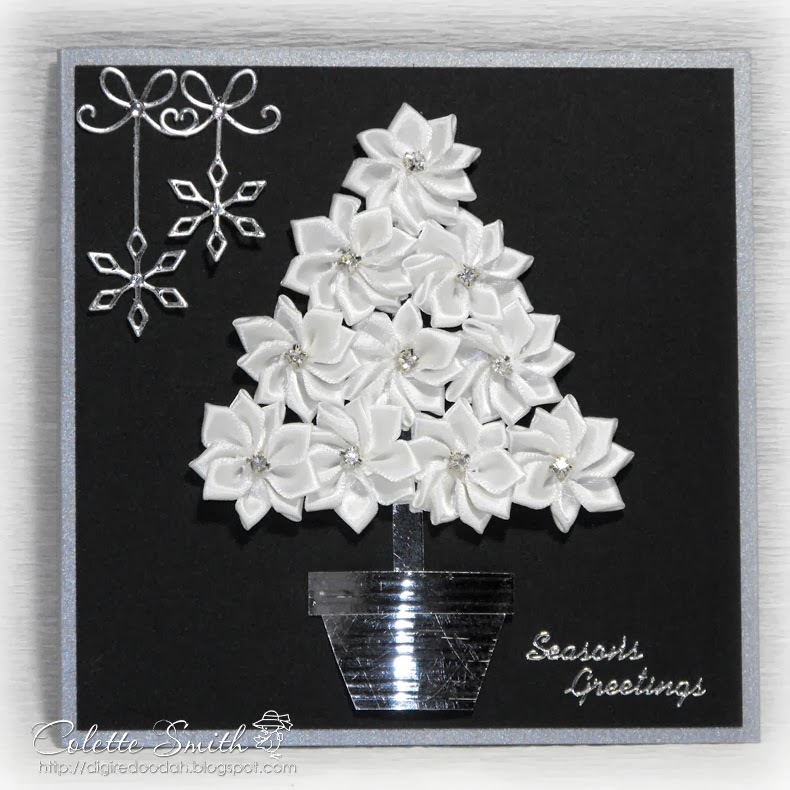 I have covered the branches with Meiflower stick on gems and Pearls, and for the tree topper, I have used a small circle diamante buckle, topped with a large stick on pearl from the mixed size pack. The bubblegum pink organza ribbon, matched the papers perfectly. Hi, I just wanted to share with you how I gave plain old Meiflower grosgrain ribbon a bit of a Christmassy sparkle. 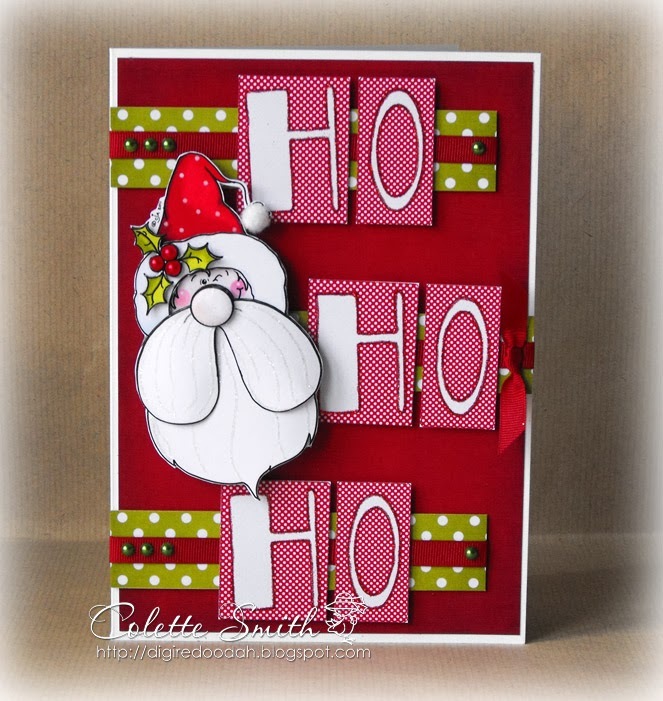 Here's the ribbon on a card. Pic not brilliant as was taken late at night, so you may have to click on it and make it larger, to actually be able to see the sparkle. Cut grosgrain ribbon to length and tie your bow, use Crafters Companion Stick n spray or 3M spray mount in a well ventilated area (preferably outdoors), place ribbon and bow onto scrap paper and lightly spray over with adhesive - then either sprinkle with glitter or if you keep your glitter in a plastic lidded box as I do, drop the items into the glitter replace the lid and give the box a good shake. Lift items out, brush gently with an old blusher brush and Voila! sparkly ribbon and bow. I used the same technique on the die cut snowflake garland too. Here's a rocker stepper card I made which contains my wish list for Santa, I really hope he reads it right this year LOL! Meiflower's red stick on pearls are just ideal to use for holly berries, and they come in a great range of sizes from tiny to large, and red gingham ribbon is the perfect finishing touch on a Christmas card. Hi there, here's a Christmas set I made using a download from Paper Creator and then embellishing it with lots of crystals, pearls and ribbons from Meiflower. 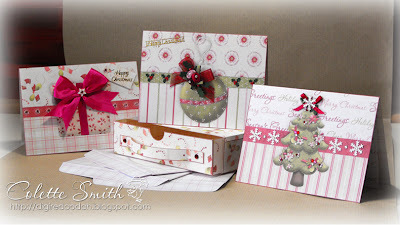 The set consists of a drawer which contains three Christmas cards and envelopes. I used a stick on pearl either side of the drawer handle. I added a satin ribbon rosebud trio and organza bow to the ornament and used tiny red stick on pearls for the holly berries. On this card I used both 10mm and 25mm Satin ribbon and pink stick on gems. I decorated the Christmas tree with 2mm stick on gems in red, deep pink and light pink, added a narrow satin ribbon bow to the top and AB crystals in the centre of the snowflakes.